New revenue generated from increasing Oregon's tobacco tax would come with an additional decline in sales because Washington buyers would likely stop crossing the river to buy, economists said Wednesday, March 20, during a legislative informational hearing. The proposal is for a $2 per-pack hike to pay for health care for low-income Oregonians. It's a move being championed by Gov. Kate Brown. State Rep. Mitch Greenlick, D-Portland, introduced a similar bill. There are also proposals to tax nicotine vaping products and remove the 50-cent ceiling on the tax on cigars. In total, six proposals would increase revenue from nicotine products in some way. All have been assigned to the House Revenue Committee and none have public hearings scheduled. In addition to funding health care, the increased tax would drive down tobacco consumption, advocates say. Jon Hart, an economist for the Oregon Department of Revenue, testified to the House Committee on Revenue that estimates show a 10 percent increase in cigarette price causes a 4 percent decline in consumption. Hart said the price increase would likely deter more young smokers who have less income. Hart also warned of seeing consumption and sales as the same thing. As tobacco prices rise, he said, smuggling cigarettes from other states becomes more prevalent. Currently, Oregon reaps "significant" benefits from Washington's cigarette smugglers. Oregon taxes cigarettes at $1.33 per pack and research shows the average price in 2017 was $6.12 per pack. Washington taxes cigarettes at more than $3 per pack. That causes Washingtonians to drive into Oregon to buy cigarettes. Hart said some people likely buy large amounts of cigarettes for friends and family. Purchasing cigarettes in other states is now the easiest way to avoid high state-imposed taxes. In 2005, credit card companies stopped facilitating online cigarette purchases, and companies like FedEx and UPS stopped shipping cigarettes. Hart said there is essentially a semicircle over Southwestern Washington that is dictated by Oregon's tobacco taxes: the higher the tax, the smaller gets the circle of potential buyers. Smokers living in the circle are likely to stock up in Oregon rather than buy in their home state. That contributes to much higher sales rates for cigarettes in Oregon. Hart testified that federal data shows Washington's smoking rate is about 14 percent and Oregon's is about 16 percent. The per capita sales rate is significantly different. In 2017, Washington sold 17 packs of taxed cigarettes per capita. Oregon sold 38. "We're actually at a point now where Oregon is selling more taxed packs overall than Washington is," Hart said. "Washington's population is not quite twice what Oregon's is." 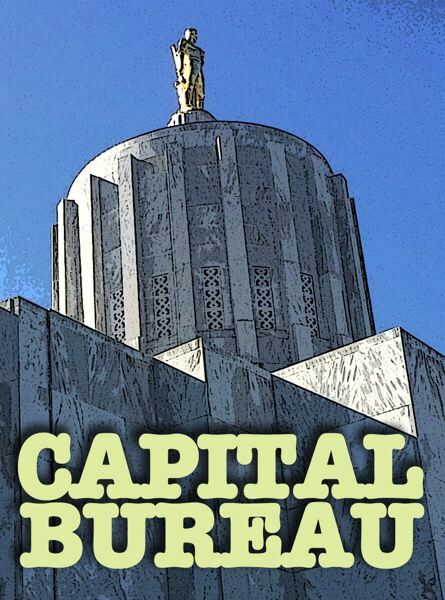 It's still not clear which, if any, of the bills will rise to the top of the order as committees throughout the Legislature are working to set priorities for the second half of the session. House Speaker Tina Kotek's spokesman, Danny Moran, said a tobacco tax increase remains a priority. Brown has repeatedly talked up the tax increase in her press briefings. A representative from her office is scheduled to go before the House Revenue Committee Thursday, March 21, as it continues to hear information on the tax. Thursday's portion will focus on electronic cigarettes and nicotine vaping, something Hart said is quickly gaining popularity among younger users due to the candy-like flavors. "I understand the mango flavor of the product called Juul — J-U-U-L — is very tasty," Hart said. "I don't have any direct experience of that."